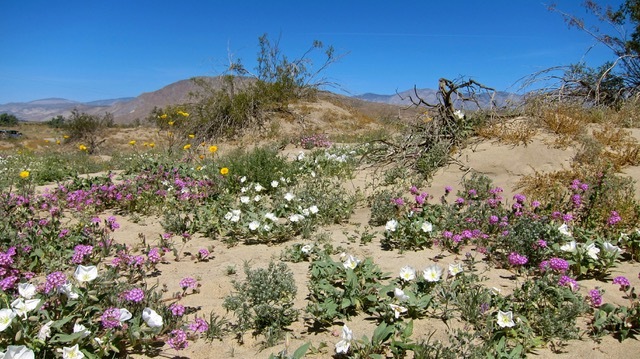 Deserts are very inhospitable and only extremely hardy plants and animals can survive and thrive in deserts. Water is the most important determinant of life in deserts. When Colorado River was accidentally diverted into a depression in the desert 110 years ago, the Salton Sea without outlet was born. 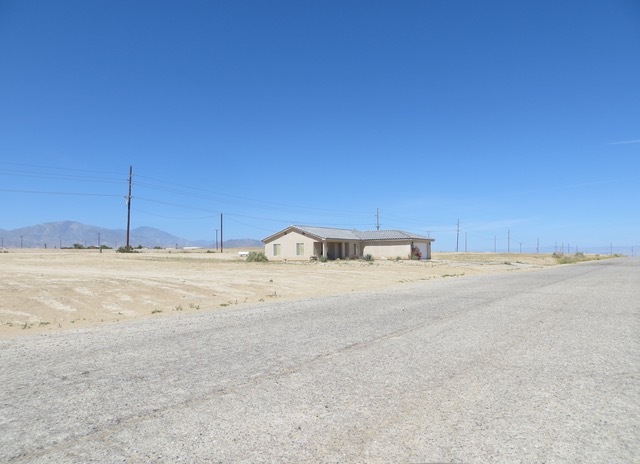 Some people had great hopes and planned a Salton City by its shore. 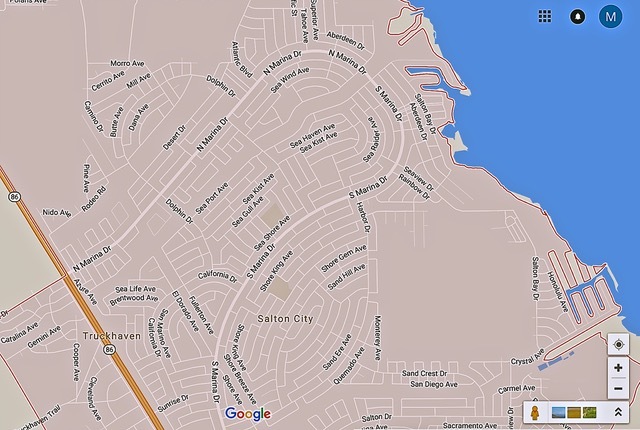 Hundreds of streets were designated on the desert floor and remain on today’s maps. Several decades later, Salton Sea became a dead, toxic sump and the grandiose Salton City never materialized. This solitary house sits on one of many planned but empty streets. Desert prevailed. 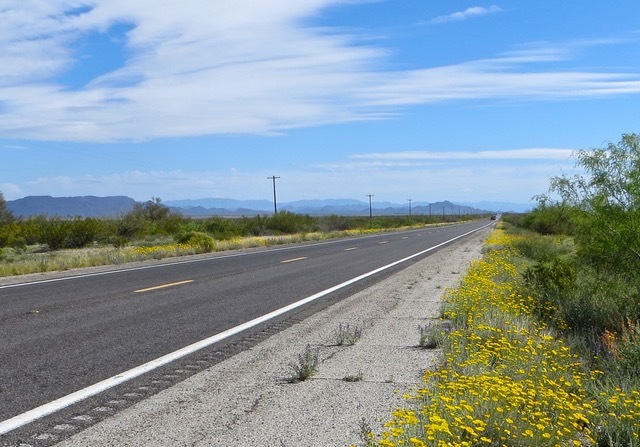 Southwestern US is mostly desert. 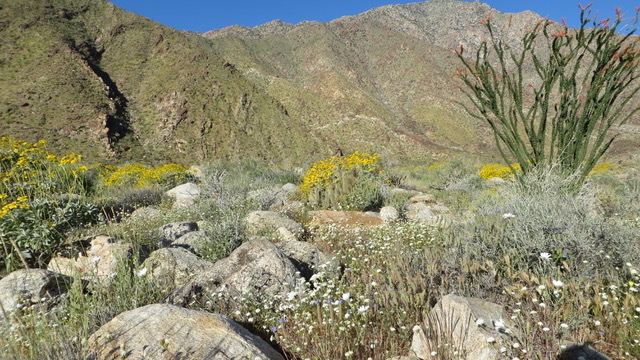 In the Spring, most of the desert is greener but still scrubby. This region had a severe drought for the last several years. But the drenching rain in the past winter awakened long dormant seeds and long suffering plants, resulting in a superbloom this Spring. Sally and I took a driving trip to catch the exuberant flowers. 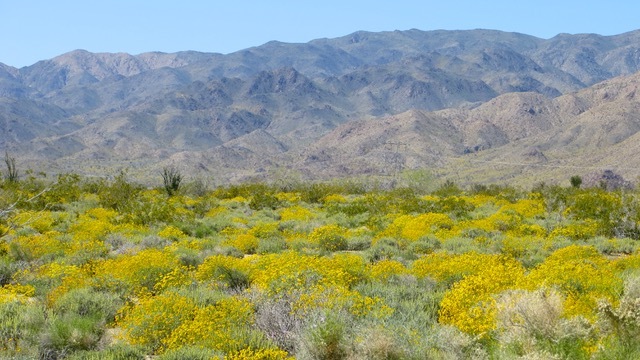 While most of the desert is devoid of flowers, some patches of landscape are rich with beautiful flowers. 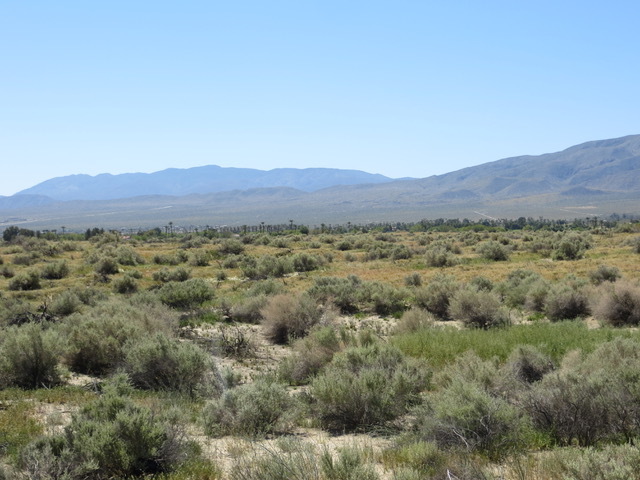 It is likely due to microclimates or ground water patterns where moisture is more abundant in these patches. 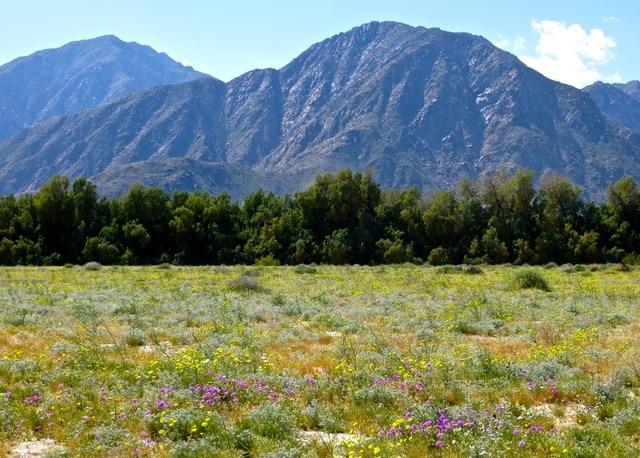 In California, we saw meadows of colorful flowers. 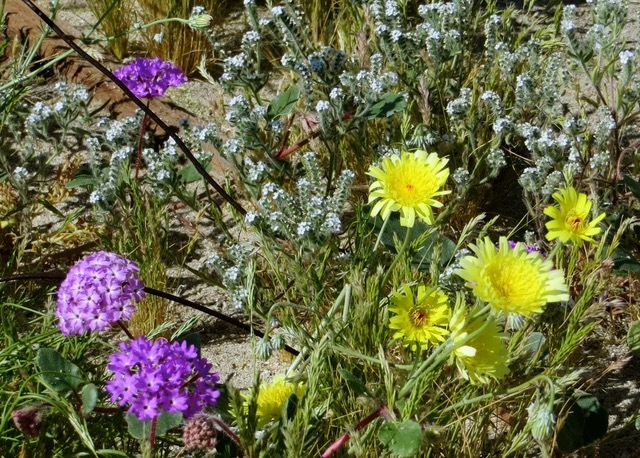 Plants in loose sand woke up with colorful flowers. These are white desert evening primrose and magenta colored sand verbena. The pleasing combination of complementary colors of yellow and magenta is showcased here. Nature is an excellent artist. As different species of plants bloom at different times, our one week of observation showed us mostly yellow, white and magenta flowers. At other times, we may see more red, blue and orange flowers. We are not greedy. We are happy with what we saw. 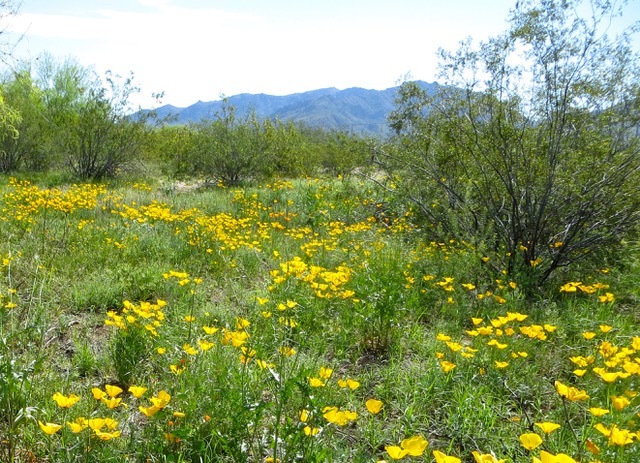 In a recess among shrubs, yellow poppies covered the ground. 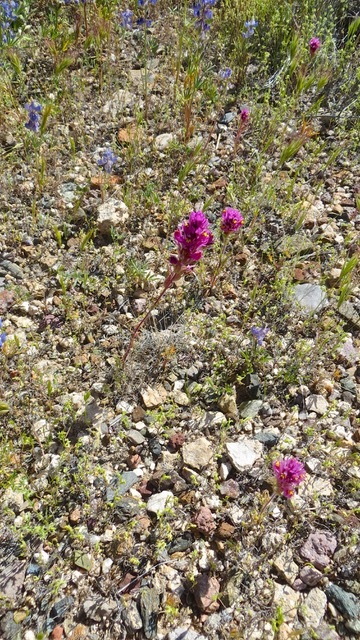 Even some pitiful plants that barely survive in poor rocky soil are blooming. These inconspicuous owl’s clover plants sprout large, lovely magenta flowers. 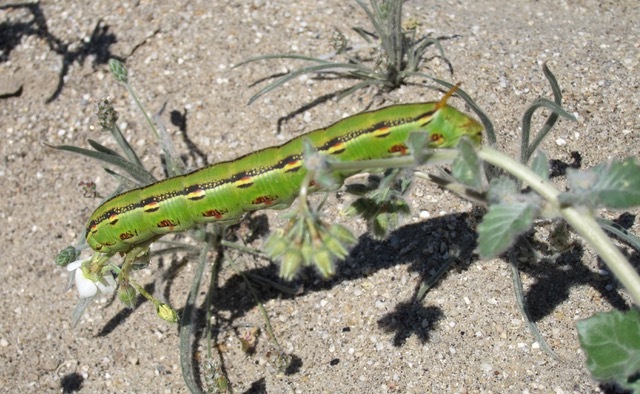 Caterpillars devour the bumper crop voraciously and become big and plump. They can denude the abundant plants and flowers quickly. There are holes in the sandy ground. 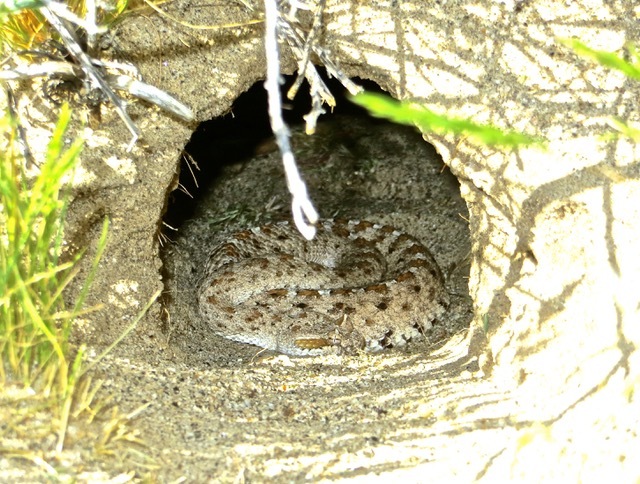 I peered into one and found a coiled rattlesnake. It quickly retreated further into its pit after I disturbed it with the flash. 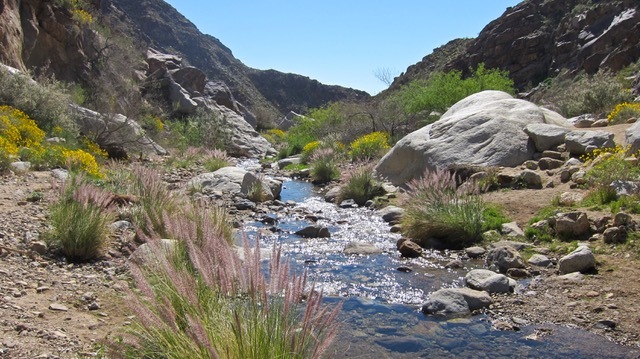 In Palm Canyon, a spring feeds a stream that runs clear and sweet until it dries up into the thirsty sandy soil. The moisture of the stream nourishes plants in the canyon. There are more flowers in the canyon than in the open desert. 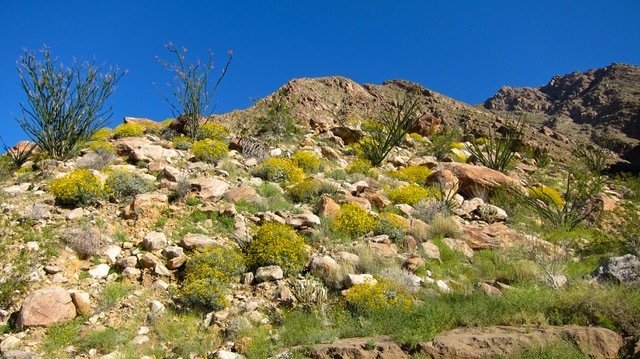 On the rocky canyon side, brittlebush mingle with spiny ocotillo. 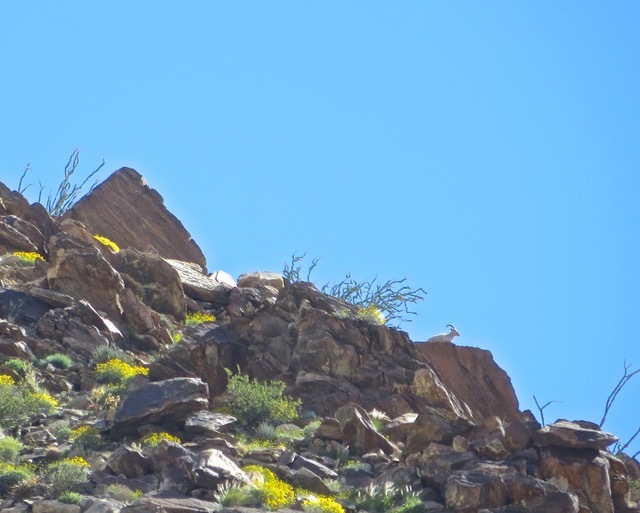 Several hundred feet above the canyon floor, a bighorn sheep surveyed from a ridge. The effect of water on plant life is demonstrated at the roadside. Precipitation that fall onto road pavement drain to the edge of the asphalt, irrigating roadside plants and flowers. 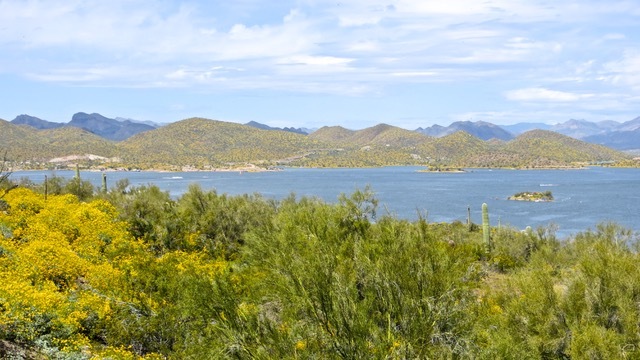 At Lake Pleasant, Arizona, moisture from the lake clearly affects the flowering phenomenon. 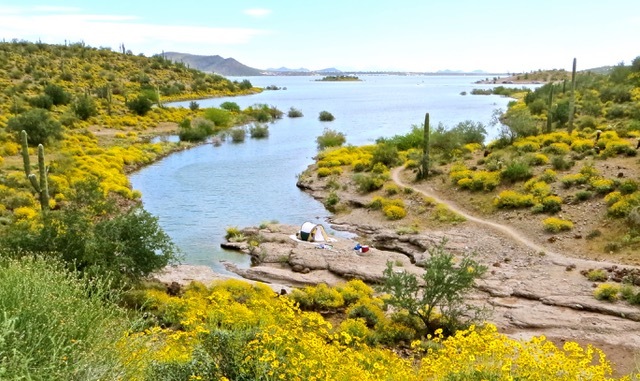 While the desert behind these hills are bare of flowers, the hills surrounding the lake are covered with britllebush flowers. 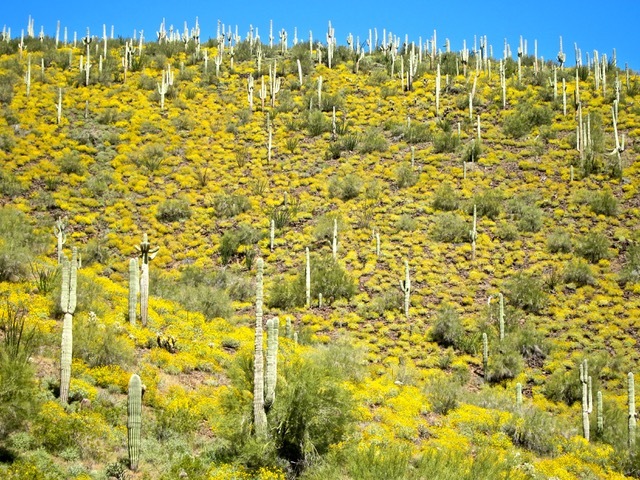 Lakeside hills are covered with tall saguaro cactus and flowering britllebush. 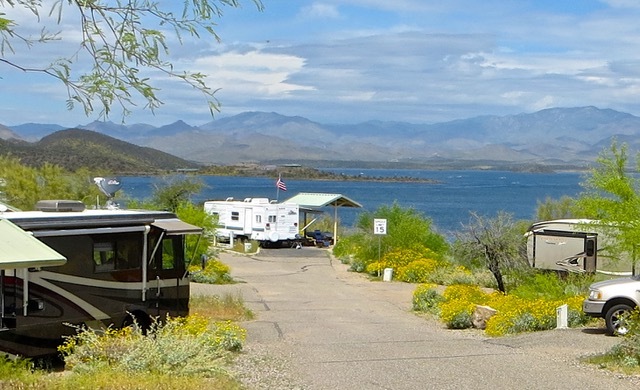 On a hilltop above the lake, a RV campground set among flowers provides beautiful views of water and hills. But the loveliest camp site I have ever seen is this tent by the tranquil lake among thousands of flowering shrubs. This must be what paradise looks like. Posted by Robert Wu on Saturday, April 1, 2017, at 10:06 pm. Filed under Uncategorized. Follow any responses to this post with its comments RSS feed. You can post a comment or trackback from your blog.